Aeratis Shutters In-A-Box take the guess work out of finding the right shutters for your home. Simply cut the shutter components to the right size and assemble. 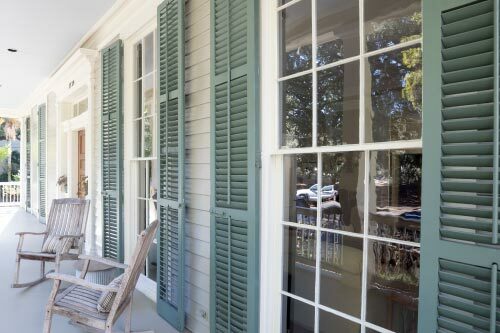 Picking a historically accurate shutter, that actually shuts, can add curb appeal and aesthetic value to your home. The best part? No waiting for custom made wood shutters, just pick up Aeratis Shutters In-A-Box at Timberline’s Beverly location. With the Aeratis Custom Shutters In-a-Box system, each component is made out of PVC and extruded to match the exact size of shutters in the early 1800’s. Many companies refer to these sized shutters as their “Architectural” line of products, and are typically more expensive. With the Aeratis Custom Shutters In-a-Box system, other’s “Architectural” shutters are our standard shutters. There is no need to reduce the size, quality or the integrity of the shutters, especially when it’s 1/3 of the cost of a wood shutter, includes stainless steel hardware, and a Limited Lifetime Warranty.